After a five-year run as one of the best players in baseball, Andrew McCutchen put up the worst year of his career in 2016. His strikeouts went up, his power and BABIP went down, and his defense was bad enough to finally precipitate a move out of center field. All told, McCutchen produced just +0.7 WAR last year, and when the team hung a superstar asking price on him in trades over the winter, they didn’t find anyone willing to meet their demands. Given that superstars don’t usually fall apart at age-29, there were plenty of reasons to think McCutchen was due for a bounce back this year. Before the year started, our projections had McCutchen putting up a 128 wRC+ and +3.5 WAR, which isn’t quite back to peak levels, but would still make him a very good player. But then, for the first six weeks of 2017, McCutchen looked like the old, shell-of-himself version we saw last year. On May 15th, when Alex Stumpf wrote about some remaining reasons for optimism for the Pirates franchise player, McCutchen was hitting .212/.288/.401, good for just an 82 wRC+. But as Stumpf noted in that piece, McCutchen’s numbers were being dragged down by a .221 BABIP, and his contact quality suggested something closer to league-average was more reasonable. With some signs of improved plate discipline, there were reasons to think that McCutchen might still have something left in the tank, even as he went on nearly eight months of unproductive play. Well, here’s what McCutchen has done since Stumpf published that piece on May 15th. That’s basically peak McCutchen, combining power with a better-than-average strikeout rate, and blistering the baseball all over the field. And while you don’t want to overreact to a five week hot streak any more than a six week cold stretch to start the year, there are a lot of promising signs here. The biggest change has been in his batted ball distribution. In the first six weeks of the season, McCutchen was running just a 15% line drive rate, as he was just getting under everything. 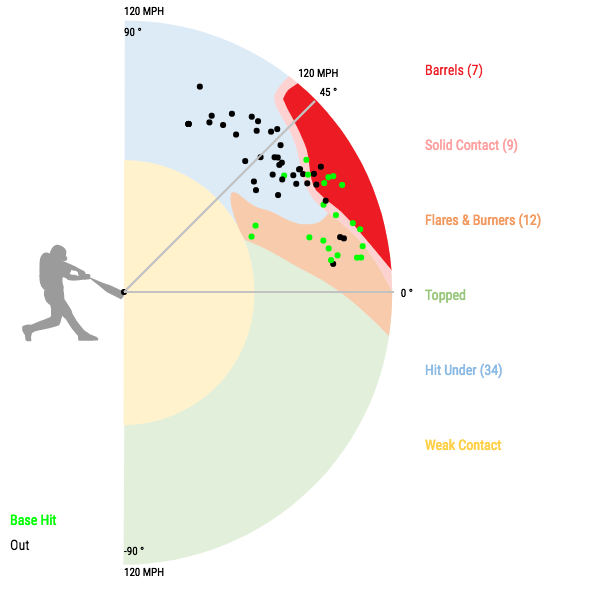 His average launch angle on non-grounders was 36 degrees, ninth-highest in baseball through that point. The Statcast Radial Chart hosted on Baseball Savant isn’t always easy to read, but in this case, shows the problem pretty clearly. Statcast had 62 tracked airballs for McCutchen through May 15th, and 34 of them had been classified as “hit under” balls. These are basically just fly outs, as he went 1 for 34 on balls with that exit velocity/launch angle combination. when 55% of your contacted balls are easy fly outs, that’s going to drag your batting line down. Since May 15th, McCutchen has 58 tracked airballs, but just 20 “hit under” balls, only 34% of his total. His average launch angle on non-grounders is down to 27 degrees, ranking 75th out of the 90 hitters with at least 50 tracked balls. His line drive rate is 25% since then, as instead of hitting lazy fly balls, he’s just squaring it up and hitting the ball more directly. He’s not really hitting the ball any harder, but as Stumpf noted, his contact authority was mostly fine even early in the season, and McCutchen’s never been a guy who crushes the baseball. He’s been more of a guy who makes a lot of good contact, and that’s what he’s done again since the middle of May. And given what McCutchen is doing with the strike zone, he doesn’t need to be an elite contact guy in order to be a good hitter. His 19.8% O-Swing is the sixth-lowest in baseball, but his 66.7% Z-Swing% is above the league average; he’s taking balls and swinging at strikes, which is pretty much the optimum combination. As Jeff noted in his post about Chris Taylor on Monday, McCutchen has one of the largest differences between swinging at strikes and balls of anyone in baseball. That’s a list of really good hitters, because controlling the strike zone is a huge chunk of good hitting. McCutchen has always had a good eye at the plate, but perhaps realizing that he’s not as physically gifted as he used to be, he’s become even more selective this year, and the result is he’s making more contact than he has in years. His contact rate is back over 80% for the first time since 2013, despite the league trending the other way, and it’s at 83% since May 15th. By taking balls and swinging at strikes, McCutchen has a high floor as a hitter, and really just needs to spray enough line drives to still be a high-level offensive player. Last year and at the beginning of this year, he was just making too much weak contact, but he seems to be fixing that issue; after hitting 24 infield flies last year, he has just four this season. Now, just because he’s hit like Peak McCutchen for a little over a month doesn’t mean that we throw out his last year plus of struggles. He is aging, and he doesn’t hit the ball hard enough to keep running the .267 ISO and .356 BABIP that he’s put up over the last five weeks. Both of those numbers will come down, and he’ll probably settle in as a good hitter instead of a great one. But given what he looked like in mid-May, the Pirates will take a good-hitting McCutchen at this point. And if he keeps this up for another month, the Pirates will likely find a trade partner for him this time, now that he’s reminded everyone that he can still hit big league pitching. We hoped you liked reading Andrew McCutchen Is Back by Dave Cameron! Lucky. This should definitely help his trade value. He’s looked better but I’d be selling as quick as I could while the narrative is positive.